Georgetown, the capital city of Penang, has been on our travel radar since it was conferred the UNESCO World Cultural Heritage Site status in 2008. Its street food scene ranks amongst the most vibrant we’ve seen. While many pushcart hawkers continue to flourish on the streets, some ply their trade in kopitiams (coffee shops) while yet others are tucked away awkwardly into narrow alleys in between decrepit shop houses. 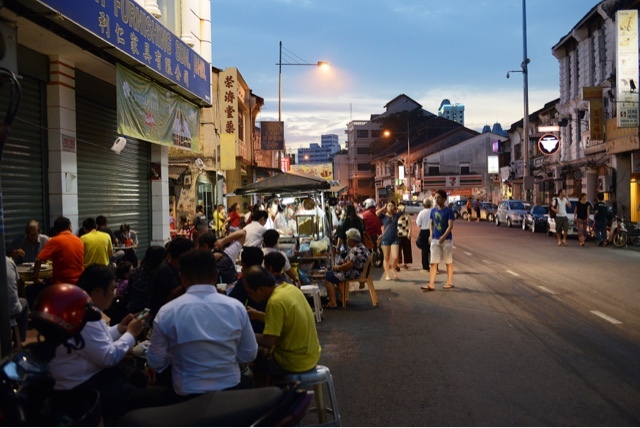 Apart from its much touted street food, a clutch of age-old eateries continue to thrive behind the façade of peeling paint and mouldy walls, fielding tze char-style favourites to Penangites and tourists alike. Of late, a cadre of hoteliers has developed a clutch of charming boutique hotels to cater to visiting foodies with a discerning taste in accommodation. Set in carefully restored heritage buildings, many of these lodgings are centrally located and serve as a perfect base to explore Georgetown’s buzzy street food scene on foot. We were compelled to make a trip to Penang when the Malaysian Ringit plunged to a new low against the Singapore Dollar recently. Unlike the United Kingdom where everything costs two times more, Penang was a steal at 2.75RM per S$1. We were not planning on writing a piece on where to eat in Penang before we left town, as such we did not take notes on prices but bear in mind that while prices are affordable based on current conversion, they are by no means cheap to locals. 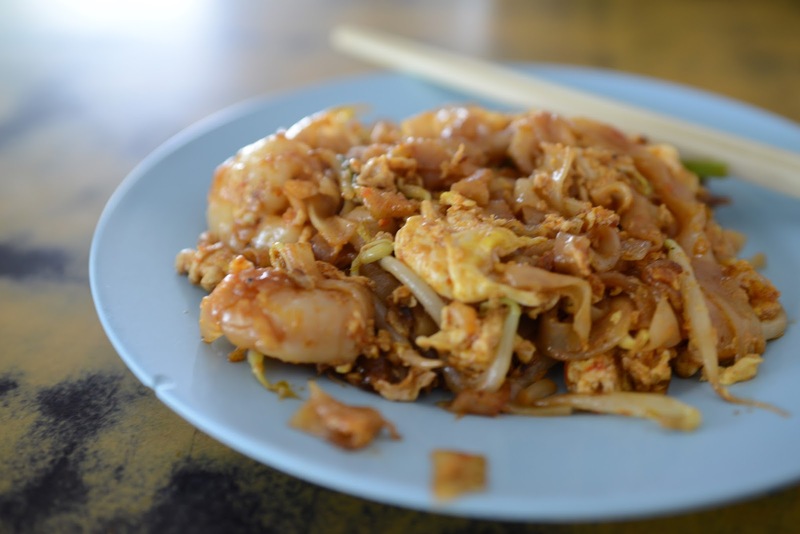 A plate of char kway teow costs about RM7.50 to 9 while a meal for four at a tze char-style restaurant will cost upwards of RM80. Whilst planning our Penang food jaunts, we plotted all the outlets we wanted to visit on Google Map (Penang) and assigned where we wanted to cover daily based on how far these outlets were from our base camp, i.e. the hotel. We stayed at the heritage Jalan Muntri neighbourhood this trip. 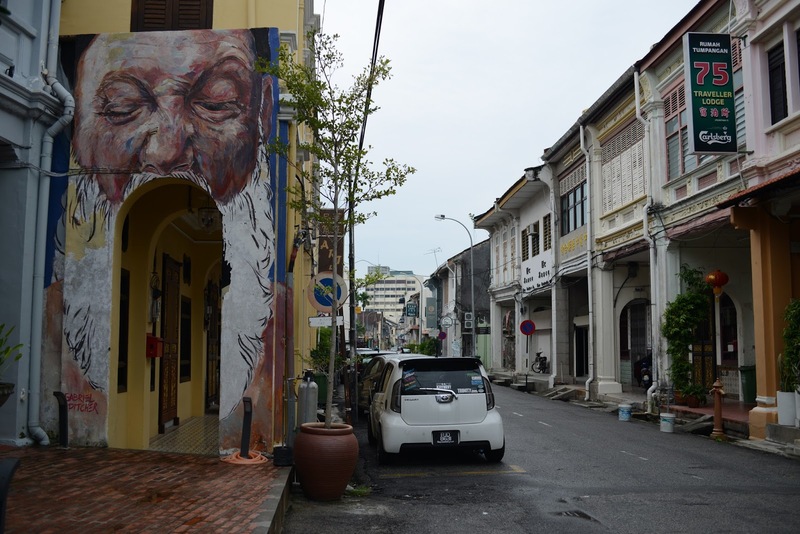 It’s a quietly charming street dotted with numerous accommodation options (from dorms and hostels to luxury boutique hotels) smack bang in the heart of Georgetown. From here, we walked to most food outlets. The heat proved blistering (therefore you would need a huge hat and a bottle of water) but we wouldn’t do it any other way. A number of food recommendations are only accessibly by cab or private car (with driver). Schedule about half a day to explore these out-of-central options by car so that you can cover them all in one fell scoop. To properly comb Penang’s rich hawker heritage, you would need to schedule about 4 days (3 nights) in Penang. We stayed for 5 nights and managed to re-visit places we love. Judging by the number of curry mee options we’ve seen around Georgetown, this fiery bowl of noodles served with a mélange of coagulated pork blood cubes, cuttlefish strips, fresh cockles and peppermint leaves appears to be a local staple. We did not survey many curry mee options this trip but the one that we’ve visited, we’d highly recommend: Tua Pui Curry Mee (23, Lebuh Kimerley, 10100, Georgetown; 9am to 5.30pm; closed on Wednesdays). My Penangite friend, however, suggested an alternative at a nameless road side curry mee stall along Lebuh Chulia (in front of Regent Furnishing Sdn Bhd at 281 & 283 Lebuh Chulia, 10200, Georgetown; 6.30pm to 12.30am; no info on rest days), which we did not get to sample. 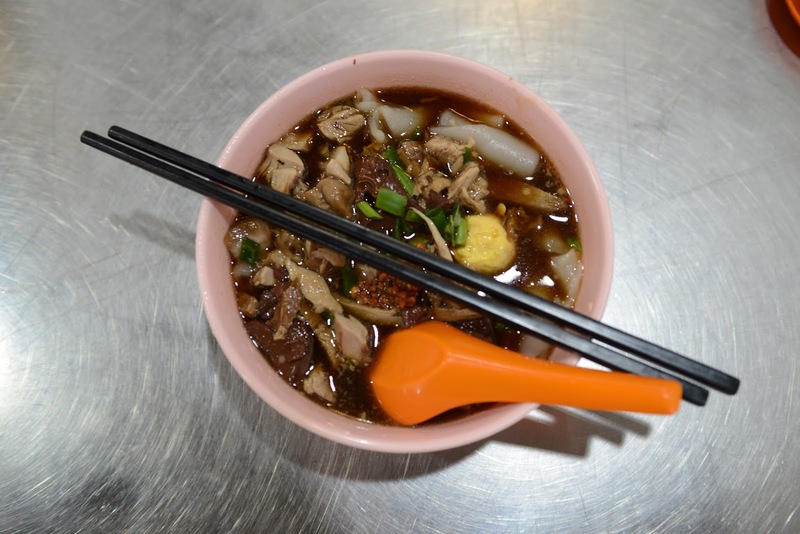 In Penang, kway chap is served with oodles of flat noodles basking in a robust and rich braised duck broth studded with shredded duck meat and pig innards (skin, blood, belly and intestines). For the best, look no further than Mr Poh’s Duck Kuay Chap (Restoran Kimberly, 137 Lebuh Kimberley; 6.35pm to 11pm; closed on Thursdays). Here, every mouthful of the velvety flat noodles accompanied by slices of the accompanying goodies was a cholesterol-busting delight. Note that this stall operates only at night and is located on the same stretch as Tua Pui Curry Mee. 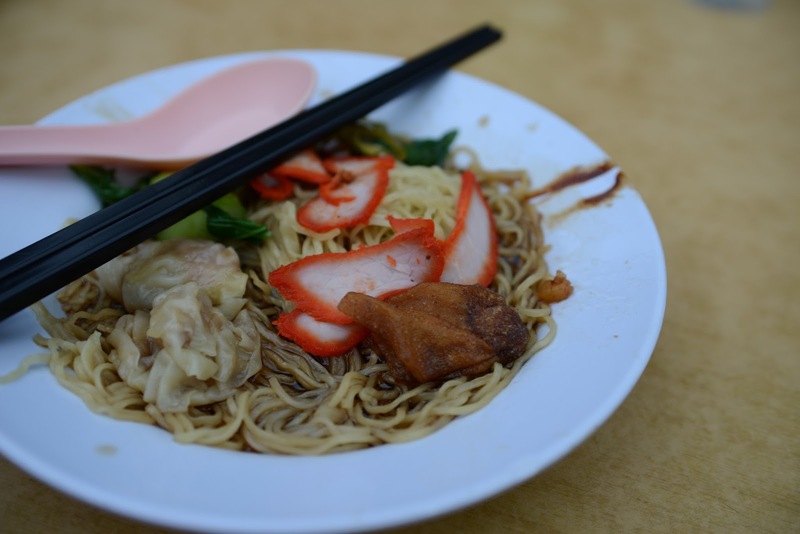 Wanton mee stalls are a dime and a dozen in Penang. Our favourite was the nameless street side wanton mee stall along Lebuh Chulia (in front of Regent Furnishing Sdn Bhd at 281 & 283 Lebuh Chulia, 10200, Georgetown; 6.30pm to 12.30am; no info on rest days). The Malaysian stlye wanton noodles were perfectly springy and served with char siew slices in a shallow pool of both beaming with the savouriness of soya sauce. If, for whatever reasons, you’re unable to get to this, skip over – literally next door – to the wanton mee stall in kopitiam Kedai Kopi Sai Lam(junction of Lebuh Chulia and Lebuh Carnavon; 5pm to midnight; no info on rest day) – the beef soup mee here is nothing to shout about but the wanton mee is not too shabby. 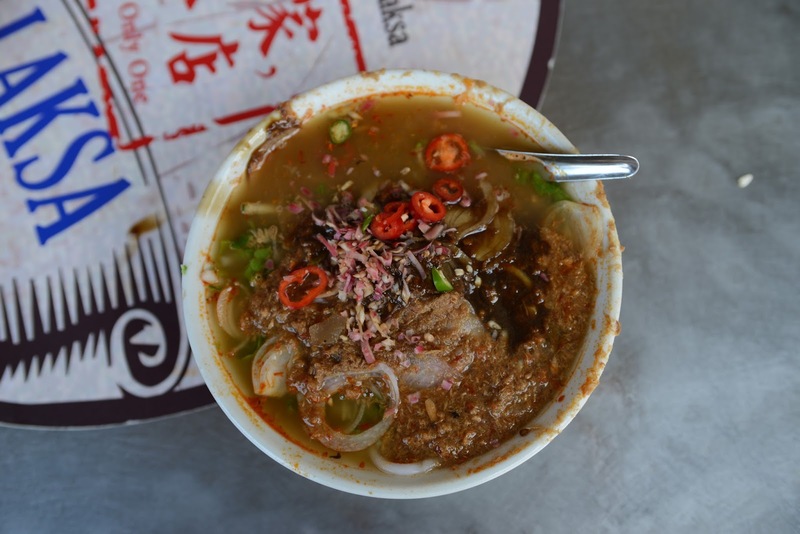 Assam laksa is probably Penang’s most-talked-about hawker food, think thick rice noodles served in a punchy mackerel based brew topped with a scoop of pungent shrimp paste. 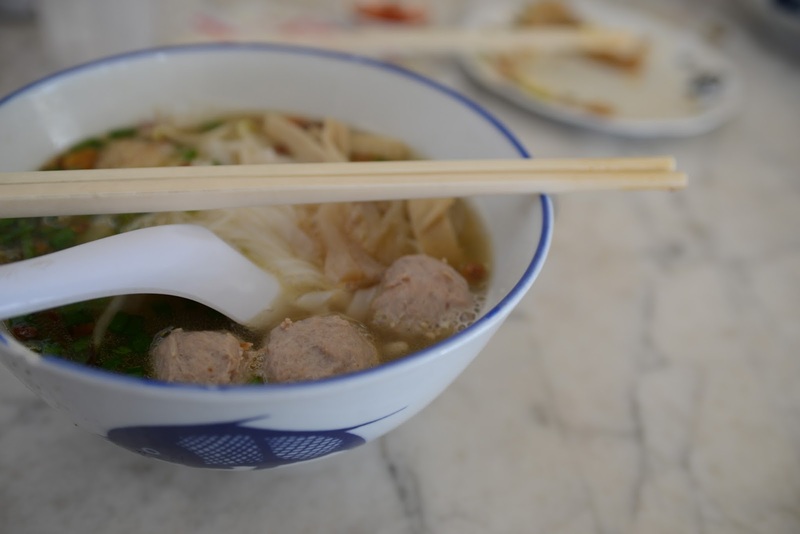 For a quick and easy fix, swing over to Joo Hooi Café (475, Jalan Penang, on the corner of Lebuh Keng Kwee; 11:30am – 5pm; daily), a kopitiam also served by various hawkers including an excellent Teochew-style chendol stall and a not-too-delicious char kway teow stall. 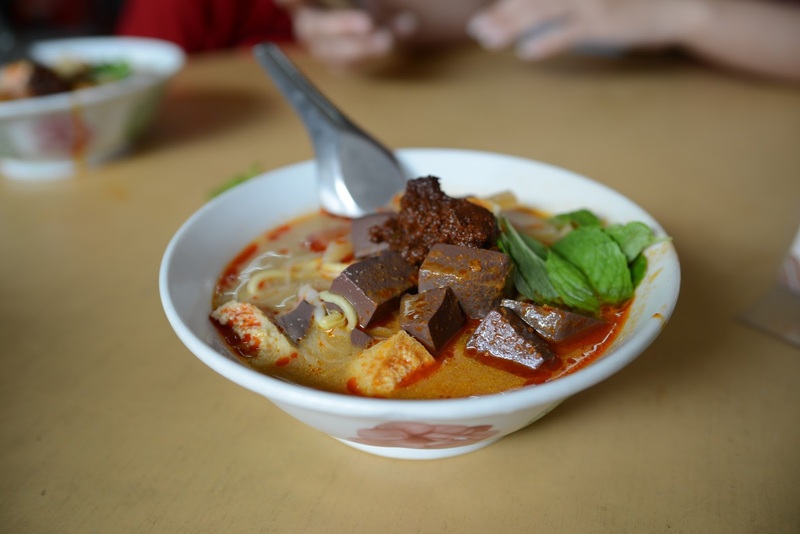 If you want to try the best assam laksa the city has to offer, catch a cab or hire a car with a driver (about RM40 to RM45 per hour) to cover a handful of far-flung hawker stalls starting with Pasar Air Itam Laksa (Jalan Pasar, 11500, Penang; 11.30am to 8pm; daily). Located along the street next to Air Itam market (about 30 minutes by car from our hotel in Georgetown), this hugely popular stall by Mr Wang – and his sons – has been dishing out the city’s most popular assam laksa for 62 years. When we first arrived, we were hungry for char kway teow but the one at Joo Hooi Café failed to lift our spirits. So when we had a hired car, we asked the uncle to drive us to Ah Leng Char Kway Teow (Restoran Tong Hooi, opp Kafe Khoon Hiang, Jalan Dato Keramat, Kampung Makam, 10150 Pulau Pinang; 8.30am to 2.30pm; closed on Thursday). If you have time on your hands and do not mind waiting in a queue for an hour or so, go further to Siam Road Char Kway Teow (Siam Road, off Jalan Anson, 10400 George Town; 3pm to 7pm). Reputed to be one of the best in Penang, the uncle from this stall apparently fries the char kway teow over a charcoal stove and serves it with duck eggs. We’ve made a mental note to visit this one for our next trip. When we tried the beef koay teow at Lam Ah Coffee Shop (Opposite Beach Road Fire Station, Beach Street at the junction where it meets Chulia Street, George Town; 9 am – 3 pm; close on Sundays and Public Holidays), we knew we’ve found the holy grail of beef koay teow. Manned by a fresh-faced young lady, the beef koay teow at this centrally located stall (just a heart beat from the wall murals at Armenian Street) boasts velvety flat noodles basking in a clean and sweet broth spiked with nothing more than garlic oil and your pick of beef parts (fresh beef slices, balls, tripe, tendons and stomach). After tasting Lam Ah, we decided not to pursue the far-flung, nameless beef kway teow stall (Jalan Tan Sri Teh Hwe Lim, 11600, Penang, same row as Lam Wah Ee hospital and right next to Eve bakery, the name of the hawker center is New B Garden Café; 4:30pm to 11:00pm; closed on alternate Thursdays), located a good 30 minutes from our hotel by car. 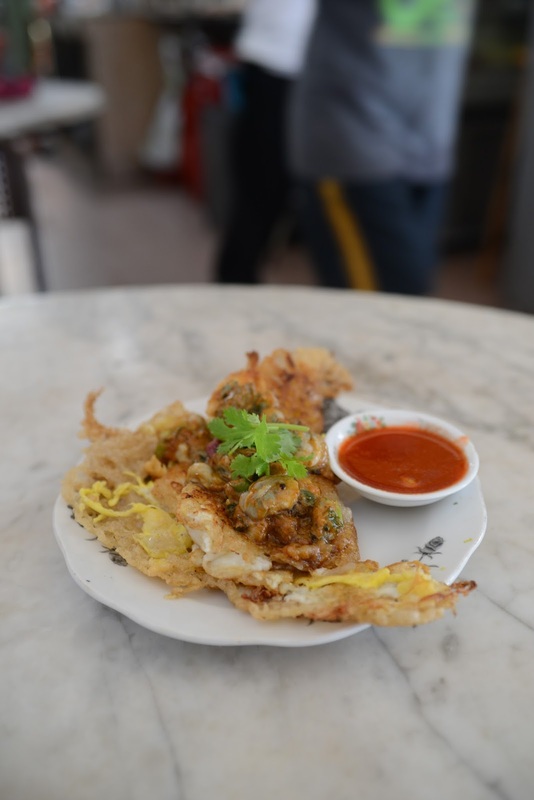 We ordered orh luak several times in Georgetown and hit the jackpot at Lam Ah Coffee Shop (Opposite Beach Road Fire Station, Beach Street at the junction where it meets Chulia Street, George Town; 9 am – 3 pm; close on Sundays and Public Holidays). We wanted a snack while waiting for the beef koay teow to be served and had this oyster omelette. It turned out to be one of the best on-the-spur-of-the-moment decisions. The orh luak here is crisp, fluffed-up and not quite as starchy as most run of the mill options. If you love orh luak, this stall is definitely worth a detour. When we hired a car with driver, Ah Soon Kor Har Mee (prawn noodles) was one of the featured destinations. However, after circling Jalan Macalister for about 20 minutes with no sign of this famed prawn noodle stall, it became apparent to us that it must have moved. After asking around, we discovered that Ah Soon Kor Har Mee has moved into a kopitiam at a new location (80 Jalan Perak, 10450, Penang, near Tua Pek Kong Temple; 7am to 7pm; daily). We were undaunted and hunted it down in 20 minutes, and were duly rewarded with a heart-warming bowl of sweet-and-savoury – someone oily – prawn noodles soup that arrived chock-a-block with roasted pork, deep-fried mantis prawns, shrimps and a hard boiled egg. Pity the empty kopi tiam; Ah Soon Kor needs to get the word out about his new venue. 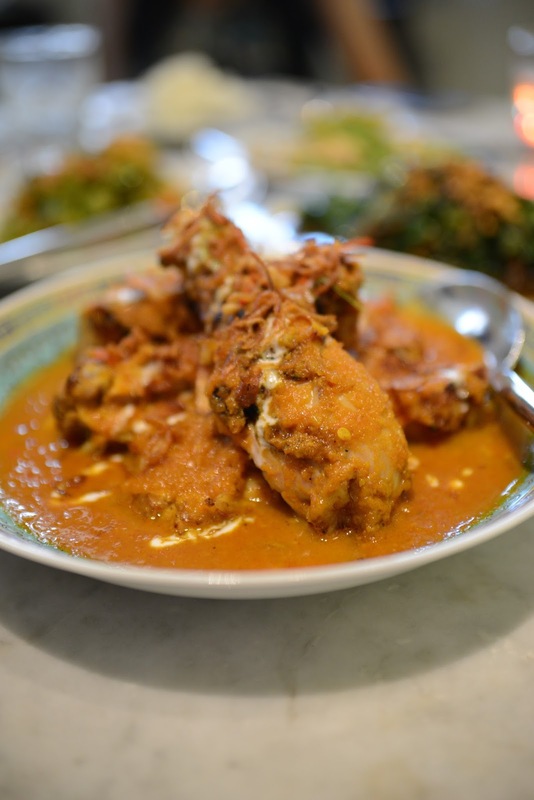 Peranakan cuisine is fairly common in Penang although you’ll come to notice that the Penangite menu is quite different to what we are familiar with in Singapore. 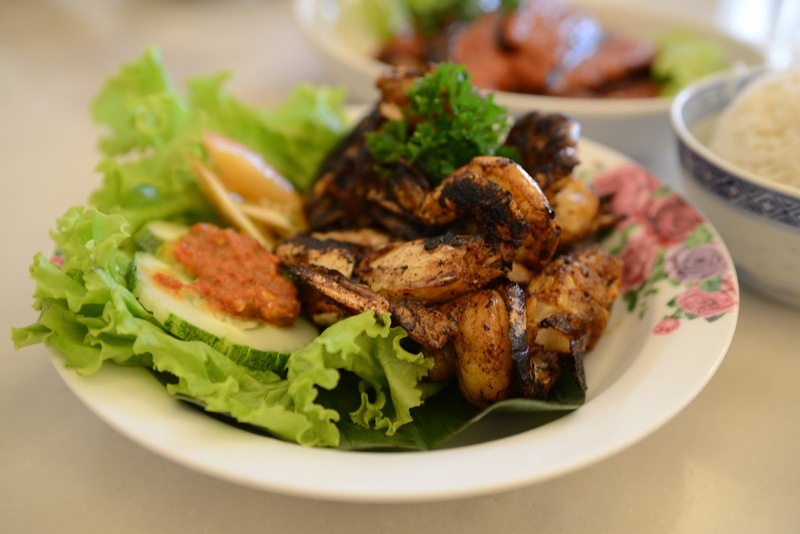 In Penang, you’ll be hard pressed to find ayam buah keluak on the Peranakan menu although chicken kapitan, a dish that we are less familiar with, features rather heavily. There are numerous Peranakan dining options in Penang; if you ask around, most would recommend Ivy’s Peranakan Kitchen (58, Jalan Chow Thye, 10250; 12noon-3pm, 6pm-9pm; closed on 1st and 3rd Monday of the month), which we did not have time to visit. A Penangite friend recommended Aunty Gaik Lean Nyonya food (1 Lebuh Bishop, Penang, 10300); 11am – 2.30pm & 6pm – 9.30pm; closed on Sundays) instead. Located not far from the Little India community (about a 15-20 minute walk from our hotel), this 2-year-old eatery by a restaurateur who used to operate in Kuala Lumpur, fields handsome Peranakan dishes like stir-fried assam prawns, sambal brinjal as well as excellent salads like the fiddlehead fern kerabu. If you yearn for Peranakan food served in a refined setting, look no more than Kebayaat the Straits Chinese-inspired boutique hotel, Seven Terraces (Lorong Stewart, 10200 Pulau Pinang; dinner only 6pm to 10pm; daily), but don’t come here expecting classics. Kebaya specializes in reinvented Straits Chinese cuisine prepped with western techniques (think sous-vide organic roasted pork and grilled chicken kapitan) and occasional Indo-Chinese influences (think prawn geng and grilled chao tom). Unless you are a hotel guest, you would have to settle for a prix fixe 4 course menu(RM120 per person). Whilst you’re at it, don’t miss the cocktails at the adjoining Kebaya and Baba Bar, it’s reputedly one of the sexiest bars in town. 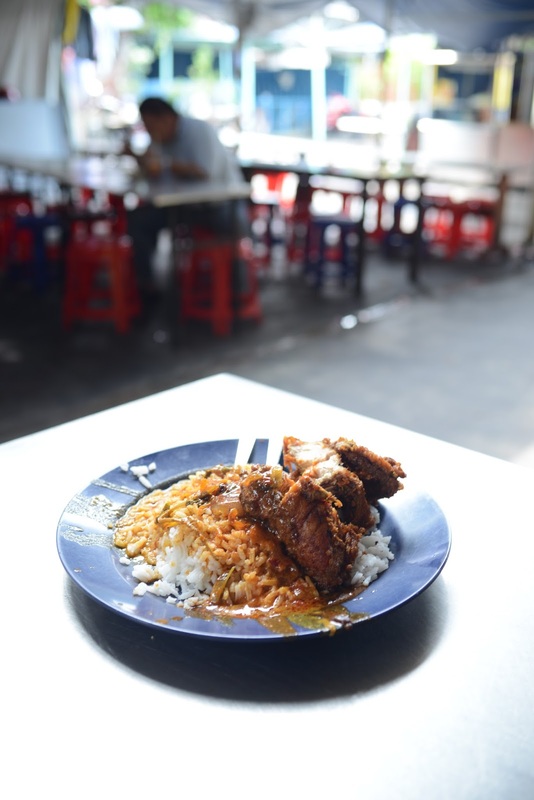 If you have time for just one tze char meal in Penang, make it the most iconic one: Tek Sen Restaurant (18 Lebuh Carnarvon, 10100 Georgetown; 12 noon till 2.30pm, 5.30pm till 9pm; closed on Tuesdays), which started life as a rice stall in 1965. Order the twice-cooked candied pork belly, sambal kang kong and steamed clams with garlic and fermented bean paste. Come latest by 6pm if you do not want to join the queue. 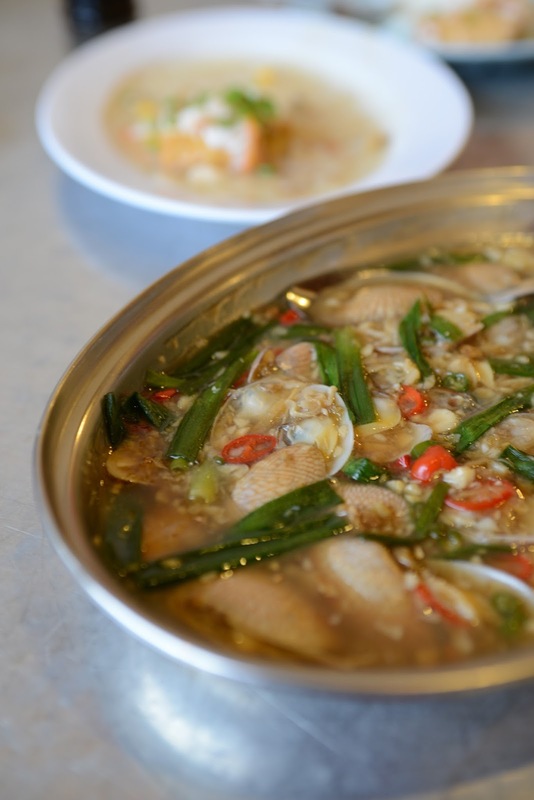 If you have time for another tze char experience, go to 69-year-old Hainan institution, Sin Kheang Aun Restaurant (2 Lebuh Chulia, Georgetown; 11am to 2.30pm, 5pm to 8.30pm) that serves home-styled Hainanese dishes without a menu and in pared down surrounds. The food here boasts gentle flavours and does not bear the fiery wok-hei of Tek Seng. Still, it’s a gem; come for lunch as it closes early for dinner. If you have a penchant for nasi padang in Penang, head to Nasi Kandar Line Clear (177 Jalan Penang, Pulau Pinang, Malaysia; open everyday for 24 hours a day) for Penang-style nasi kandar, plain rice or biryani doused in curry and served with your selection of sides like fried chicken, curry fish head and vegetables). 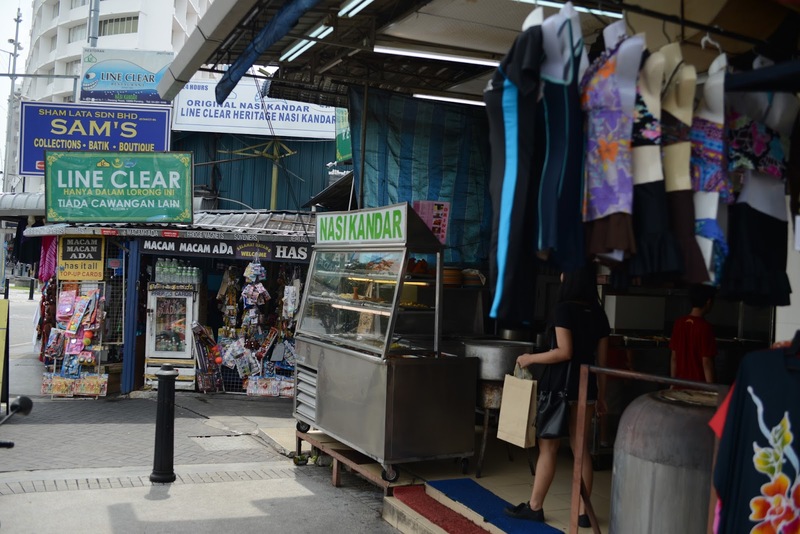 Note that Line Clear is tucked away in a “hidden” alley in between shop houses; do not make the mistake of walking into its next-door, housed-in-a-coffee-shop nasi kandar neighbor. Look here (http://www.penang.ws/dining/5-best-nasi-kandar.htm) for more nasi kandar options in Penang. Just a few meters from Line Clear, you will see a 2-unit shop house retailing Ban Heang tau sar peah (and other goodies). Be sure to grab a few boxes back home to give away to friends and relatives. Better yet, savour some while you’re in Penang, nothing beats eating this sweet and savoury pastry fresh. We don’t have the address of this outlet as we chanced upon it whilst searching for Line Clear. 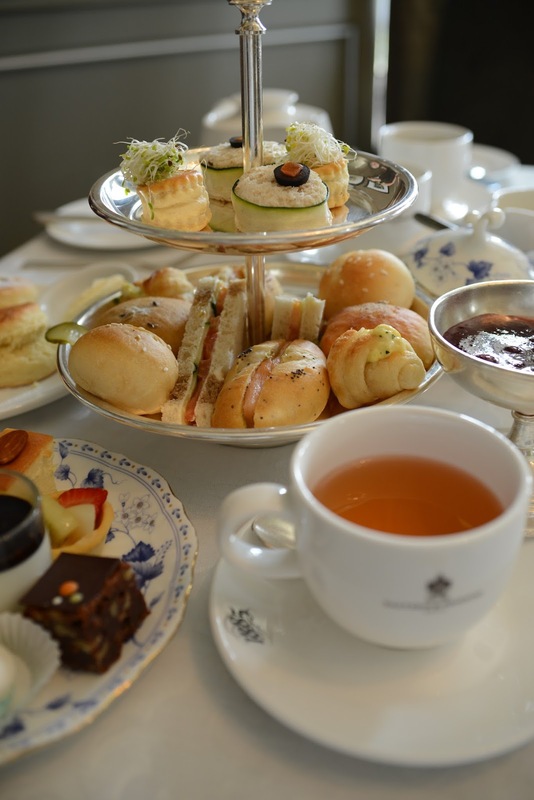 People say that to experience Penang is to enjoy an English afternoon tea at 1855 in the iconic E&O Hotel (10, Lebuh Farquhar, 10200 Georgetown; 2pm to 5pm; daily). Bear in mind that this experience does not come cheap, you pay about RM65 for a limited serving of scones, open-faced sandwiches and a number of fanciful tartlets. 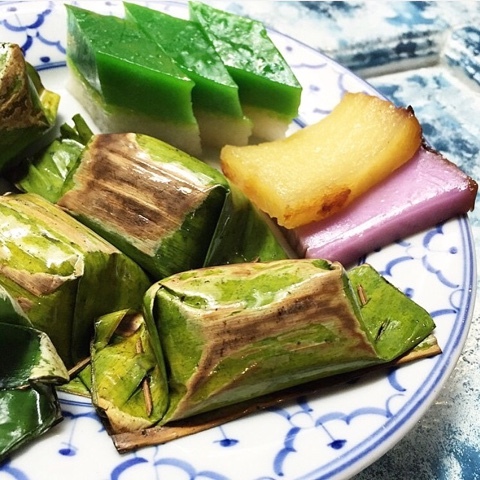 If you have time for just 1 afternoon tea, we’d much prefer you go Peranakan at Moh Teng Pheow Nyonya Kuih (off 10200, Chulia Street Night Hawker Stalls, Lorong Chulia, Georgetown, 10450; 10 am to 5 pm; closed on Mondays). Hunting down this entrance-less joint is truly laborious but the discovery of the parade of not-too-sweet nonya kuehs – like sri muka, rempah udang – and the utterly delicious nasi ulam more than makes up for the chore. Whilst researching on where to eat in Penang, we referred to the following resources: Miss Tam Chiak , Ken Hunts Food and Time Out Penang , with additional consulting from my Penangite friend, Tzekomah. 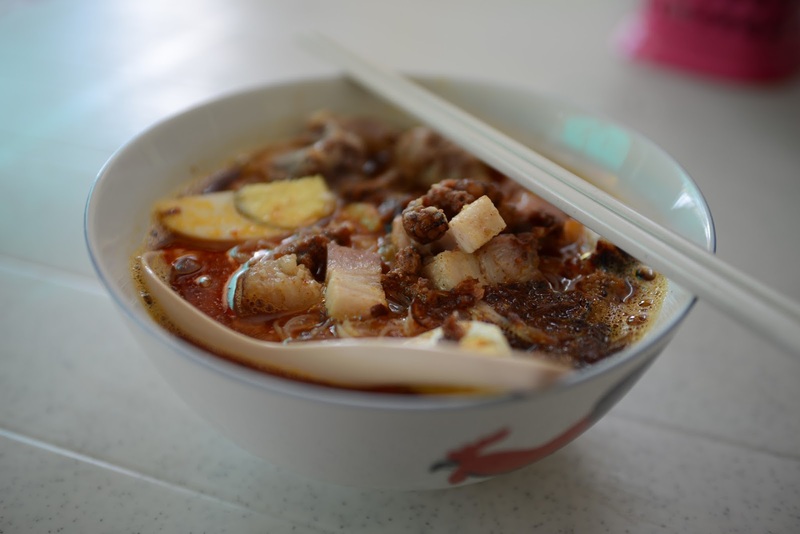 The food in Penang is amazing and cheap too, with a wide variety of food along the streets as well as in restaurants. In addition, the prices in Penang are ridiculously cheap, and some shops do offer a generous helping of food! Some recommended places to go include the street below the hill where Kek Lok Si Temple is situated (S$2 per person), Yang Yang Cuisine at Nagore Road (S$8 per person) and the famous 24 hour prata stall opposite grand inn hotel!